Uncommon early map of Bermuda. A scarce c. 1630 small format map of Bermuda by Johannes Cloppenburg. Based upon an earlier maps by Gerard Mercator and John Speed, this map shows the whole of Bermuda. Around the edges of the map parts of neighboring islands and the mainland of North America peak out - although admittedly wildly out of proportion to the size of Bermuda. These include Virginia (really modern day North Carolina / Cape Hatteras), Cape Cod (which peaks out from top center), New England (Upper right), and Hispaniola, lower left. Bermuda itself follows the conventions set down on the famous John Speed / Norwood map wherein various tribes are identified throughout. Some of the surrounding coral reefs are also noted. The title cartouche appears in the bottom right. Upper left and lows left quadrants feature distance scales. This map was engraved by Pieter van den Keere for the c. 1630 Cloppenburg edition of Mercator's Atlas Minor Since the Cloppenburg edition failed to attract public interest, it had a short print run, leading all of its maps be exceptionally uncommon. Johannes Cloppenburgh ( fl. c. 1610 - 1644 ) was a Dutch cartographer active in Amsterdam during the early 17th century. Cloppenburgh was associated with the Hondius Firm and is generally credited with the 1630 edition of the Mercator / Hondius / Jansson Atlas Minor. He is also identified on some map imprints as Cloppenburg, H. Jan Evertsz, and Johannes Everhardus. Cloppenburgh is a somewhat elusive figure of whom little is known. The cartographer should not be confused with the German theologian of the same name and period. Pieter van den Keere (1571 - c. 1646) was a Dutch engraver and cartographer active in London and Amsterdam in the late 16th and early 17th centuries. Keere, who is alternatively known as Kaerius or Coerius, was born in Gent, the son of printer and type founder Hendric van den Keere. Religious persecution in the Low Countries forced Keere, with many others, to take refuge in London, where they established themselves. There Keere married the sister of Jodocus Hondius, also a refugee in London, and it was most likely through Jodocus that he mastered engraving and mapmaking. Keere is responsible for numerous maps, most of which are associated with the Hondius firm. Some of his most notable works include numerous county maps of the British Isles that were later compiled into Camden's Britannia. Keere also engraved many of the maps included in the Jansson Atlas Minor. 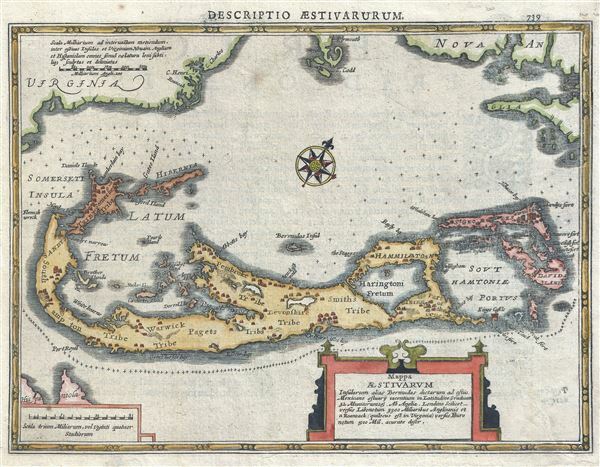 Mercator, G, Atlas Minor, (Amsterdam: Cloppenburg) 1630. The Atlas Minor by Johannes Cloppenburg was first published in 1630. Cloppenburg's atlas competed with three other 'minor' versions of Mercator's Atlas. Cloppenburg's Atlas Minor consisted of reduced versions of Mercator's groundbreaking maps, most of which were engraved by Pieter van den Keere. The Cloppenburg edition was the largest and most complete of the three miniature atlases, but nonetheless proved the least popular. Some have speculated that, seeing a rival for his own smaller Atlas Minor, Johannes Janssonius acquired and suppressed the Cloppenburg plates. They plates later reappeared in 1735 when they were updated and republished by Henri du Sauzet as the Atlas Portatif. Very good. Original platemark visible. Remarkable nearly invisible older repair lower right corner. Latin text on verso.